I traveled specially to Britain in February 2018 to help commemorate the hundred years since women won the vote in 1918, make a new source public and reveal a unique living connection with the campaign. On February 6, I went to the Isle of Bute to tell the story of two women and their work for women’s equality. I was there, for personal reasons, on the very day of the centenary to commemorate the enfranchisement of some women by the Representation of the People Act, 1918. My focus was the Women’s Freedom League (WFL) – the 1907 breakaway from the WSPU – and its annual summer campaigns. This presentation in Rothesay, in the Firth of Clyde on Scotland’s stunning west coast, was the second of three I gave in 6 days. The previous Saturday, February 3, I delivered a short version in Cambridge at a suffrage commemorative conference, revealing for the first time the story I heard long ago and had researched widely since. Afterwards, many of the audience commented on how moved they were, which took me by surprise. I wove into the broad history of the WFL’s suffrage campaign in Rothesay the tale I heard directly from a Miss McCann about her work with “Madam Lenton.” The WFL Clyde Coast Campaigns began in 1908 and continued until 1928, the year when the equal voting victory celebrations switched the rest of the WFL’s campaign for equal rights into high gear. The island town became the WFL’s summer base because massive crowds of workers from Glasgow’s heavy industries travelled there on Clyde paddle-steamers to holiday. Centrally located in the Firth, the frequent steamers from Rothesay to other coastal resorts enabled the women to address even more workers. In Dunoon, they’d meet under the image of Highland Mary – a rare statue of a woman in the nation – and they could make it back for their regular evening meetings on the Pier Head in Rothesay – which they always held, unless they were rained out. Miss McCann and Madam Lenton were speaking to their own kind. Leicester-born Lilian Lenton’s father was a carpenter. Born in 1891, she was one of the most notorious of the pre-war WSPU campaigners, setting fires to buildings and nearly dying after force-feeding in Holloway in 1913. She won no vote in 1918. Miss McCann’s father was a riveter in John Brown’s shipyard in Clydebank. Despite serious illness, and penury due to 1920s unemployment on Clydeside, she made it to Glasgow University, planning to teach. 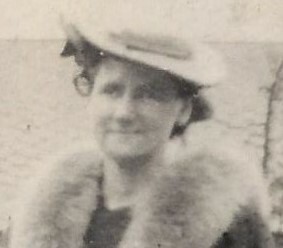 Dr. Frances Melville, Mistress of Queen Margaret College sent her in 1930 – she was aged 21 and still a student – for a holiday on the coast to help Lenton in the women’s rights campaign that summer. Dr. Melville was one of the women who challenged in the House of Lords the exclusion of women graduates from the universities’ vote. In 1908, the eminent Law Lords declared that women were not persons in voting matters. And Miss McCann would begin, “I’m here today under the auspices of the Women’s Freedom League,” and then go into women’s achievements and potential; to equal rights, the importance of the vote, women in parliament, divorce equality, child custody, the right to work, the double moral standard and equal pay. Her most colourful anecdote told of how the trained dancer Lenton dealt with the wee Glasgow men in flat caps who always tried to heckle her off the stage with “A wummin’s place is in the hame!” The cry in 1930 was loud because, with the depression, all women were targets for exclusion from work with so many men unemployed. But, said Miss McCann, Madam Lenton had the answer that flattened the wee men in the flat caps. Miss McCann also backed Madam Lenton up in Dunoon, shaking the collection box under the noses of young men with a girl in tow to shame them into donating. Though she worked with Lenton after equal voting was won, Miss McCann always called herself a suffragette or suffragist, while the training she received probably served her well in her lifetime of teaching maths to tough kids in Glasgow and Clydebank schools. Like the suffragettes long ago, many audience members travelled by boat to the Isle of Bute for my talk, which Eleanor McKay of Live Argyll organized with the help of the Bute Museum and the Rothesay Public Library. My 80-strong audience included retirees, a history class from the high school, and many local history buffs, equaling the turnout for recent talks on Harry Potter and crime fiction. “Boring old” history held its own in good company. Only minimal references to this story had appeared in the histories and no one in the audience had ever heard of Rothesay’s part in suffrage. When Miss McCann spoke of it, she said wistfully that everyone in the town had forgotten about it, and so for me to reveal the story in that very place on the centenary was deeply meaningful. It made listeners gasp and turned some to tears. I fought for my own composure. I had to head off immediately afterwards to Stirling, where in the Smith Art Gallery and Museum, with the Castle towering overhead, my next presentation was more of a bird’s eye view of the WFL’s work in Scotland. This broader talk included the same story as before and for the third time my audience had a strong emotional response, none of which I had anticipated. The reason it was so powerful was that I left to the end the most pertinent fact about Miss McCann. I first heard her tale in 1968 at the 50th anniversary of the voting victory at the end of a Lilian Lenton interview on the BBC, when Miss McCann said to me quietly that she had worked with Lenton. A student of history at the time, I was hooked, asked her about it many times after that, and, in 1984, knowing that time was running out, bought the best tape recorder possible and on a trip home from Canada caught what I could. Less than two years later, Margaret McCann – my mother, who married Peter Cahill of County Durham in 1948 at the age of 39 – died. I captured only about twenty minutes of her memories of that summer, but, adding it to my own memories and those of her youngest daughter, Dr. Catherine Smith of Stirling, about our mother’s tale, we have preserved a wonderful personal record for posterity. It also enabled me to stir interest in some long-forgotten history of a small Scottish resort town, where my mother worked 90 years ago and to share it on the centenary of the great suffrage victory. The discovery that their town had played the central role in what may be the longest-running suffrage and women’s rights campaign in Britain, transformed many of the audience. Several locals and the high school class are now hard at work trying to find answers to some questions I raised about this segment of women’s history on the Isle of Bute. Emigrant Scot Bernadette Cahill is an M.A. (Hons) History Graduate of Glasgow University who has researched and published in the United States for several decades. Author of Alice Paul, the National Woman’s Party and the Right to Vote: The First Civil Rights Struggle of the 20th Century and Arkansas Women and the Right to Vote: The Little Rock Campaigns (both 2015), her third suffrage history, about the mid-1860s U.S. campaign, is nearing completion. Photo credit: “Miss McCann” c. 1945. All her earlier personal papers and belongings, except the clothes she was wearing, were destroyed during the Clydebank Blitz of March 1941. Source: Family Archive, with permission.